It’s our favorite time of year! The time when we celebrate the merriest of seasons while working to ensure a safety net and a hand up for our friends and neighbors who have fallen on tough times. So in the next few weeks, here are the things we are celebrating, and we hope you will too! [Update 12/5/13] The ending time for Cans Film Festival was misstated as 6pm when it ends at 5pm. Our apologies for the confusion! This new, annual tradition is celebrated by charities all around the globe, and we would be honored to receive your support. Without your help, children all over Missouri and southern Illinois would not have Christmas and feel the love and security that all children deserve to feel. Make a donation December 3, and feel great that you have made a difference. Let’s check off the movies we want to see, shall we? The Hunger Games: Catching Fire. Frozen. 12 Years a Slave. Last Vegas. The Book Thief. Or, if it’s your thing, Bad Grandpa. And you can see them for the great price of 5 CANNED GOODS at all Wehrenberg Theaters. That’s right. What would normally cost you $10-15 depending on the theater, will cost you the very reasonable price of 5 cans per person at all Wehrenberg locations. The goal is to raise 500,000 cans for families in need, so bring the family and enjoy the show. The St. Louis Rams and Emerson have a challenge for everyone: as the Fox 2/KPLR 11 personalities and our favorite Rams players ring the bell at the Des Peres Schnucks, the goal is to raise $25,000. That includes a dollar for dollar match up to $10,000 thanks to Emerson. Shake some hands, snap a picture, and give hope to people in our community. Win-win-win. While you’re out shopping for the loved ones in your life, drop off an unwrapped toy in marked bins at Walmarts throughout the region, and we will distribute that toy to kids in need in partnership with Toys for Tots. After a few years of passing by St. Louis, the Kansas City Southern Holiday Express is BACK! As KCS generously donates gift cards to us from their employees to purchase toys and coats for kids in need, Union Station and KCS will host a Winter Wonderland including photos with Santa, face painting, balloon artists, interactive sports inflatables, cookies, hot chocolate, holiday music and movies! This is entirely free for all, so come down and get the kids rallied for Christmas! Come grab a picture and hang out with your St. Louis Cardinals and drop some money in the kettle in the process! Come out to the Richmond Heights Schnucks from 10am – 6pm to hang with our NLCS champions. Drop some virtual change in your favorite personality’s kettle, and get a chance to win a brand new Mazda 3 courtesy of Bommarito Auto Group. $10 will get you one entry, and the number of entries are unlimited. Ever gotten a new car for $10? Now’s your chance. And all money goes to support The Salvation Army’s efforts to help people all across Missouri and southern Illinois. Our favorite Christmas group is back, and they are giving us $.25 of every ticket sold! So know that when you buy your tickets, they are going to a great cause! Fiats are wonderful cars, and Lou Fusz is donating $25 for every car test driven at their Fiat Illinois and Creve Coeur locations as an extra incentive to fall in love with your new wheels! Tell us which of these you are most looking forward to–and we’re excited to see you! 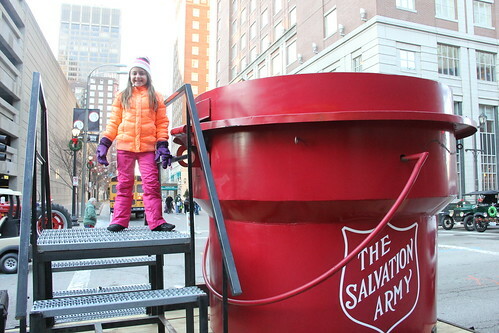 Salvation Army Tree of Lights Kickoff Slated for November 20! St. Louis − The Salvation Army is officially kicking off its 2011 Tree of Lights campaign during a tailgate party before the St. Louis Rams game against the Seattle Seahawks on Sunday, Nov. 20. This year’s Tree of Lights chairman is Kevin Demoff, COO and Executive Vice President of Operations for the St. Louis Rams. The Tailgate Party & Kickoff Program will be held in the Broadway Room in the America’s Center from 12:30-2 p.m., followed by the game at 3:05 p.m. in the adjoining Edward Jones Dome. Tickets for admission to both the game and Tailgate Party start at $160 per person and include a $47 donation to The Salvation Army. Table sponsorships start at $1,500 and includes eight tickets to the party and game. All game tickets are field level tickets. Those interested in purchasing tickets may contact Angie Merseal at (314) 646-3193. In a year of economic hardship and unprecedented natural disasters, The Salvation Army has come to the aid of those in need throughout Missouri and Southern Illinois. More than ever, The Salvation Army is seeing families and individuals asking for aid for the first time in their lives. The Salvation Army reaches out to the region through more than 100 programs at 14 regional worship and community centers. · 24,618 people given assistance in response to disaster in 2011, to date. The Salvation Army is an international organization that has been doing the most good in the St. Louis region for 129 years. The Salvation Army serves community members 24 hours a day, 7 days a week, 365 days a year through emergency disaster services and dozens of different programs that are designed to help people attain, or regain, self-sufficiency. For more information, please call 314.646.3000 or visit http://www.stl-salvationarmy.org.